I am organising an innovative event that will be fully remote and web-based. 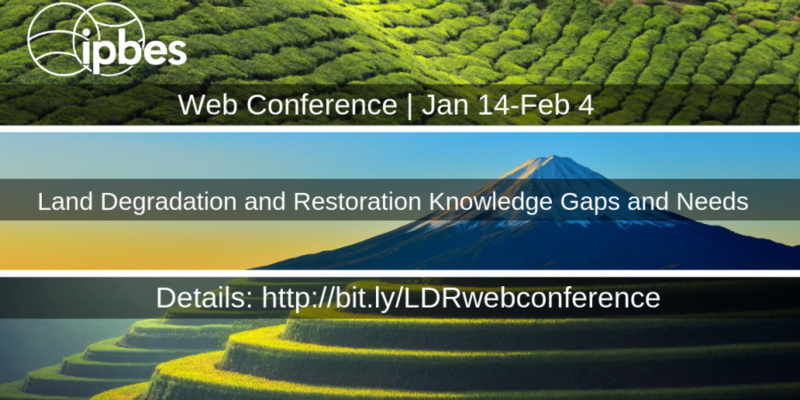 The web conference process will use webinars for the introduction and conclusion sessions and then a online discussion forum open during 3 weeks for all participants to join conversations on some topics related to knowledge gaps and needs on land degradation and restoration. But you might wonder what is the context and why this subject. Have you heard of IPBES? Maybe not..This is an intergovernemental platform bringing together scientists and knowledge holders across disciplines and regions to provide the best available knowledge on issues related to Biodiversity and Ecosystem services. It is a bit like the IPCC but for Biodiversity. One of their latest report deals with the current state of knowledge on “Land degradation and Restoration”. This topic is critical especially in the face of climate change that will exacerbate current land degradation phenomenons. This assessment also identify some knowledge gaps that are sometimes limiting policy decisions and actions to address land degradation challenges. Previous Post What is facilitation?